Basil (UK: /ˈbæzəl/, US: /ˈbeɪzəl/; Ocimum basilicum), also called great basil or Saint-Joseph's-wort, is a culinary herb of the family Lamiaceae (mints). There are many varieties of basil, as well as several related species or hybrids also called basil. The type used commonly as a flavor is typically called sweet basil (or Genovese basil), as opposed to Thai basil (O. basilicum var. thyrsiflora), lemon basil (O. × citriodorum), and holy basil (Ocimum tenuiflorum). While most common varieties of basil are treated as annuals, some are perennial in warm, tropical climates, including holy basil and a cultivar known as "African blue basil". Basil is an annual, or sometimes perennial, herb used for its leaves. Depending on the variety, plants can reach between 30 cm (0.98 ft) and 150 cm (4.9 ft). Its leaves are richly green and ovate, but otherwise come in a wide variety of sizes and shapes depending on cultivar. Leaf sizes range from 3 cm (1.2 in) to 11 cm (4.3 in) long, and between 1 cm (0.39 in) and 6 cm (2.4 in) wide. Basil grows a thick, central taproot. Its flowers are small and white, and grow from a central inflorescence that emerges from the central stem atop the plant. The exact taxonomy of basil is uncertain due to the immense number of cultivars, its ready polymorphy, and frequent cross-pollination (resulting in new hybrids) with other members of the Ocimum genus and within the species. Ocimum basilicum has at least 60 varieties, which further complicates taxonomy. The name "basil" comes from Latin, basilius, and Greek βασιλικόν φυτόν (basilikón phutón), "royal/kingly plant", possibly because the plant was believed to have been used in production of royal perfumes. The Latin name has been confused with basilisk, as it was supposed to be an antidote to the basilisk's venom. Basil is native to India and other tropical regions stretching from Africa to Southeast Asia, but has now become globalized due to human cultivation. Most culinary and ornamental basils are cultivars of the species Ocimum basilicum, but other species are also grown and there are many hybrids between species. Traditionally a green plant, some varieties, such as 'Purple Delight' have leaves that appear purple. Basil grows between 30–130 cm (12–51 in) tall, with opposite, light green, silky leaves 3–11 cm (1.2–4.3 in) long and 1–6 cm (0.39–2.36 in) broad. The flowers are small, white in color and arranged in a terminal spike. Unusual among Lamiaceae, the four stamens and the pistil are not pushed under the upper lip of the corolla, but lie over the inferior lip. After entomophilous pollination, the corolla falls off and four round achenes develop inside the bilabiate calyx. The most commonly used Mediterranean basil cultivars are "Genovese", "Purple Ruffles", "Mammoth", "Cinnamon", "Lemon", "Globe", and "African Blue". The Chinese also use fresh or dried basils in soups and other foods. In Taiwan, people add fresh basil leaves to thick soups. They also eat fried chicken with deep-fried basil leaves. Basil (most commonly Thai basil) is commonly steeped in cream or milk to create an interesting flavor in ice cream or chocolates (such as truffles). The leaves are not the only part of basil used in culinary applications, the flower buds have a more subtle flavor and they are edible. Research studies of the essential oil showed antifungal and insect-repelling properties,including potential toxicity to mosquitos. 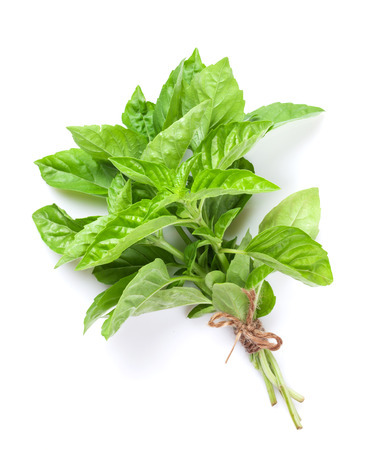 There are many rituals and beliefs associated with basil. The French sometimes call basil "l'herbe royale" ("royal herb"), while Jewish folklore suggests it adds strength while fasting. In Portugal, dwarf bush basil is traditionally presented in a pot, together with a poem and a paper carnation, to a sweetheart, on the religious holidays of Saint John and Saint Anthony. However, basil represented hatred in ancient Greece, and European lore sometimes claims that basil is a symbol of Satan.